In Chinese Economic Statecraft, William J. Norris introduces an innovative theory that pinpoints how states employ economic tools of national power to pursue their strategic objectives. Norris shows what Chinese economic statecraft is, how it works, and why it is more or less effective. Norris provides an accessible tool kit to help us better understand important economic developments in the People's Republic of China. He links domestic Chinese political economy with the international ramifications of China’s economic power as a tool for realizing China’s strategic foreign policy interests. 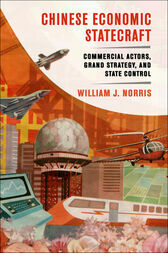 He presents a novel approach to studying economic statecraft that calls attention to the central challenge of how the state is (or is not) able to control and direct the behavior of economic actors.Norris identifies key causes of Chinese state control through tightly structured, substate and crossnational comparisons of business-government relations. These cases range across three important arenas of China’s grand strategy that prominently feature a strategic role for economics: China’s efforts to secure access to vital raw materials located abroad, Mainland relations toward Taiwan, and China’s sovereign wealth funds. Norris spent more than two years conducting field research in China and Taiwan during which he interviewed current and former government officials, academics, bankers, journalists, advisors, lawyers, and businesspeople. The ideas in this book are applicable beyond China and help us to understand how states exercise international economic power in the twenty-first century. "An impressive scholarly addition to our study of the contemporary Chinese foreign policy. It should be of great interest to both China Studies scholars as well as anyone interested in foreign policy analysis and international political economy."